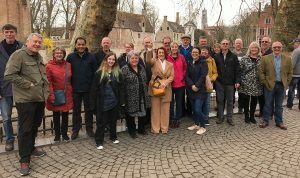 Members of the Tenterden-based Wealden Business Group are divided in their opinions on post-Brexit trading conditions, with some seeing opportunity, and others difficulties. Other members were, however, more cautious….. There was a strong plea for the government to restore certainty…..
Wealden Business Group meets at The Little Silver Country Hotel, Tenterden for breakfast networking every Wednesday. Owner/managers of small and medium enterprises are invited to join by emailing Group secretary Dee Bateman at deebateman@hotmail.co.uk, tel: 07958 612937.